Renault Winery (L.N. Renault & Sons), Egg Harbor, N.J.
Renault is a winery located in Egg Harbor City, Atlantic County, New Jersey. As of 2015 it was the oldest active winery in New Jersey and some web sites say in the United States. Louis Nicholas Renault, a former vintner for the Duke of Montebello at Rhiems, center of the French champagne district, established his winery in 1864. The winery opened to the public in 1870 and for many years was the largest producer of champagne in the United States. The winery once cultivated 600 acres and sold 500,000 cases of wine per year. In 1919, John D’Augustino and family bought the winery and continued to operate it during National Prohibition under a special government permit. The permit allowed the production of wines for religious and medicinal purposes. Renault Wine Tonic, which had an alcoholic content of 22 percent, became the chief product and was sold in drug stores across the nation as a health tonic. A label warned not to chill the tonic because it would turn into wine. (It was 44 proof alchohol with an added ingredient called peptine. When chilled, the peptine separated and froze on the bottom leaving the wine floating on top.). 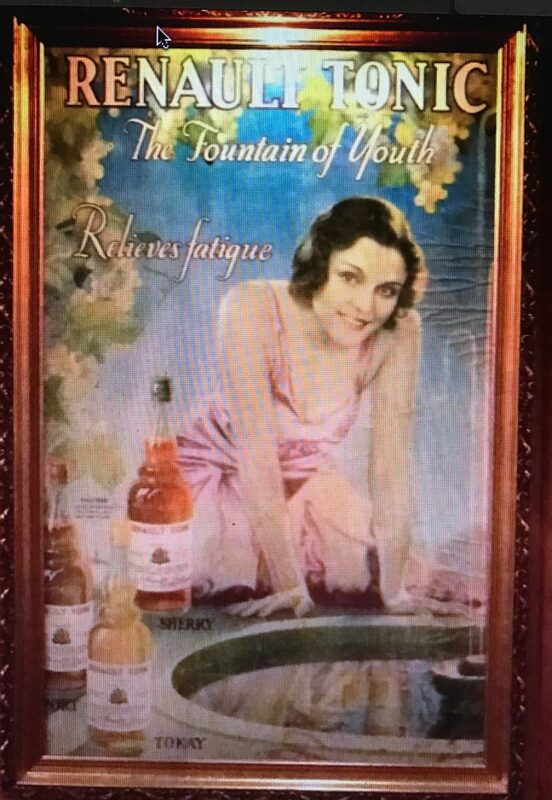 An advertisement for Renault Tonic featured a young woman in a pink gown and called the tonic the “fountain of youth” touting that it relieved fatigue. The advertisement listed three flavors; tokay, sherry and port. In recent years, the business expanded into a resort featuring a hotel, restaurants and a golf course and wine production decreased. As of September 2015 they had filed for bankruptcy but were still open. The bottle I found is a quart size machine made bottle. It’s identical to the bottles pictured in the Renault Tonic advertisement described above so it’s almost certainly a Renault Tonic bottle from the 1920’s.